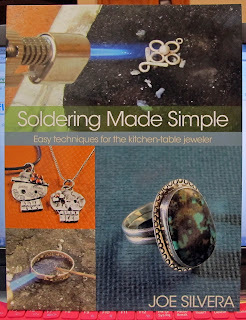 Part of my Christmas package included several books, one of which was “Soldering Made Simple. Easy techniques for the kitchen-table jeweler” by Joe Silvera, publication date of 2010 by Kalmbach Books. This book is just what I was looking for in that it focuses on easy to find small torches. I have to admit I’m afraid of using the larger torches so maybe if I start small I can move up as my confidence grows. The book is beautifully photographed with 111 pages of easy to understand and follow directions. There are 12 jewelry projects that demonstrate various techniques including making head pins, decorative balls, making and soldering jump rings, attaching bails, dapping, and much more. The projects are projects I would enjoy making and wearing. With instructions so clear, I’m sure I could complete the projects while learning new techniques. One of my goals has been to add metal to my polymer clay jewelry and this book will help me do that. If you have a chance to buy, borrow or check ths book out from the library, do so. I think you’ll find this to be a great resource. Thank you for your lovely review of Joe's book! With your permission, we'd like to include an excerpt of your review on our Kalmbach Books web site in our "Recent Reviews & Media Mentions" section, and in our marketing material for the book. You will be credited, of course, and a link to your blog will be included. If you could let me know if it would be possible for us to post an excerpt on our site or quote the review in our marketing material, I'd appreciate it. Feel free to e-mail me at eneckar@kalmbach.com. Support My Art - Thank you!! Creating mixed media jewelry is my current passion. As an artist, I've worked in many different mediums including paint, metal, fiber, fabric and whatnot. I've started blogging to share my creative journey. My studio name, Sweet Willow Designs, is a nod to the many hours I spent under the willow tree in my grandparents' Haverhill, Massachusetts home. The magical world I enjoyed under that sweet willow inspires me even today.